What do you do when it's too windy to sail? A Star class sailor friend of mine says that "if you show up to the site, you have to go out." However, he did mention that "if" is the operative word. Although we did show up to the venue, we soon found out that all 350 youth competitors from the Bic Techno Worlds were beached. Only one RS:X sailor from Korea, training for the worlds, was brave enough to go out. He got beat up and slammed for about 15 minutes, and then came back to the ramp as fast as possible. He was greeted by a standing ovation and cheering from about 100 kids and other sailors hanging out on the club balcony. Normally when conditions are dangerous, sailors will do another kind of workout. I ended up going running and doing calisthenics. It's also an opportunity to check out the area and be the tourist that you never get to be. I joined in a group of RS:X sailors visiting the Portland Lighthouse and cliffs near the seaside. Two sailors from Canada and the Netherlands enjoy the enormous swell. I almost didn’t make it to Weymouth to train. One of the many things I was working on in California was getting a visa to the UK. On a normal tourist visa, Americans are allowed into the country. Unfortunately, last year as I flew in from Poland trying to visit a friend, I wasn’t allowed entry. The UK immigration officials weren’t satisfied I wasn’t trying to steal British jobs (really long story). Having two competitions in the UK, I needed to make sure I would be allowed into the country. Four days before the start of our training camp, my visa was granted. Naturally, I was en route from Oregon to California at the time (part of my backup plan for training). I made a snap decision to turn around and drive back across the country. After four days of nonstop driving to Annapolis, I had one day at home to pack and run errands before driving to New York to fly to London. It was about the longest trip of my life! Weymouth and Portland National Sailing Academy; upper body of water is Weymouth Harbor; large beach Chesil Beach. View from Portland. As you can see, I felt the opportunity to train in Weymouth before the Worlds was one not to miss. The crazy trip was entirely worth it as I entered a week of coaching and testing at the Weymouth / Portland National Sailing Academy that was intensely productive to my sailing. Again I was working with Christoph Sieber, and two other athletes, Carolina (sailing for Portugal) and Arne (Belgium). In addition to us three, many other international sailors showed up for training this week at the National Sailing Academy. Quite a few of our practice sessions were like a real regatta with 15+ girls on a starting line. Our group worked on technique heavily, and Christoph made and analyzed a lot of video. Weymouth harbor is a good place to work on technique, especially in breeze. When there is sea breeze, the harbor is flat and fast, and it is easy to work on speed with a partner, or perfect tacks and jibes. It was a good and professional feeling to have a coach on the water with me, and it helped my focus immensely when he could give me specific goals for practice races and tuning. Learning things like how to set small goals can be extremely helpful for when I’m training without a coach. It keeps my focus to the immediate task at hand and improves the quality of the training session. Sideways: On the boat, Christoph gives me advice. 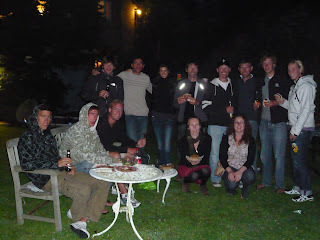 International sailors and coaches grill out and enjoy the evening after training. I am finally visiting my friend after my thwarted attempt last year (she is stationed at RAF Mildenhall near London) and the time here has been a great break before the Worlds. It is almost a relief to settle into “real life” for a short time. In a few days I head back to Weymouth to begin the intense schedule of two back-to-back regattas, the RS:X World Championships and the ISAF Grade 1 event, Sail for Gold. A special thanks to my sponsor, Compass Marketing, this month, for really making it possible to compete at a higher level at these important regattas.